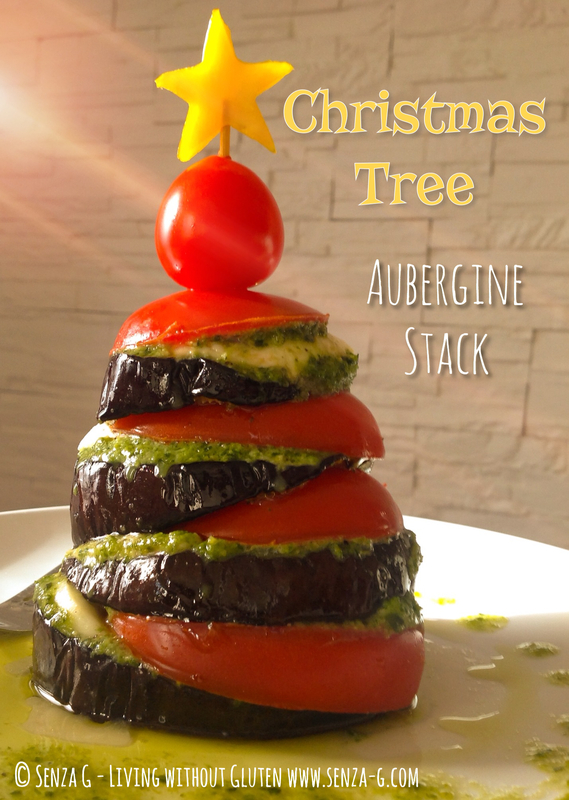 Make this popular aubergine starter for a simple Christmas Entree. You can prepare, slice and season everything and also grill the aubergine slices ahead of time and then just put it together. Best if you put the tomatoes and mozzarella on paper towels so it absorbs any liquid. I would allow one small aubergine per person. You can use the leftovers for another dish. You will also need one Bufala mozzarella and one large tomato per person. You do not need to make your own pesto, however, try to use the fresh ones available at supermarkets. Slice off the bottom of the aubergine. Then start cutting slices diagonally. The same with the tomato and if possible the mozzarella. Place the aubergine slices on lined baking sheets, brush with olive oil and season with salt & pepper. Grill until they are done. Do not overcook them. One little trick. I first assembled everything before I put the aubergine slices in the oven. Then I marked the aubergine slices, assembled as they were, with a skewer, the bottom one was pierced once on the side, the second, twice etc. That way it will be easier to stack them precisely. When the aubergines are done, place the bottom one on a serving plate, put some pesto all around its edges and place the mozzarella slice followed by the tomato slice. The higher end opposite the higher end of the aubergine. Continue with the other slices. Finish off with a cherry tomato on top and a star cut out of a yellow pepper. As a dressing, you can either a little pesto mixed with olive oil and drizzle at the bottom of the tree or else you can mix a little olive oil with a few drops of balsamic and drizzle the same way. Both are lovely. Note – Do not put the dressing immediately as the stack might weep water, mostly from the mozzarella. Place paper napkins around it, so this will be absorbed. Then drizzle before serving. 1 Comments: "CHRISTMAS TREE AUBERGINE STACK"